Herbs are just as beneficial for animals as they are for people. There are herbs that act as tonics, keep the skin healthy, repel fleas, aid digestion, get rid of worms and even give them a ‘high’, like catnip and cat mint! Cats and dogs not only share our gardens, they actually use them more than we do! So why not create a herb garden, or a corner in the herb garden that gives them pleasure as well? A herb corner for happy pets will include all the herbs that we as humans also use and I am sure that our companion animals will be more than happy to share them with us. Having observed my own pets interacting with the garden, I would like to suggest the following elements for a pet friendly corner. Herbs for pleasure that they like to eat (and are good for them). Herbs that provide shade and shelter. This meets your pet’s need for private, cool places where they can sleep or hide, especially cats. These should be large bushy herbs that also have therapeutic properties. Water in bowls or shallow ponds, or trickling fountains, from which they can drink. Herbs for health which include tonic herbs that maintain health as well as those with a specific action, such as repelling fleas or reducing worms. Flowering herbs for aesthetic purposes as well as to attract pollinators such as butterflies and bees. An old log or branch that dogs can jump over and cats can use as a scratching post. Herbs for pleasure include Cat grass (Dactylusglomerata) and Dog grass (Spartinapectinata) that your pets will visit every morning for a nibble. These grasses have nutritional value, benefit the digestive system and can act as a purgative. Many cats also enjoy catmint (Nepeta mussinii) and Nepeta x faassenii‘Alba’ a white flowered version that they also chew. It does affect some cats but not to the same extent as catnip (Nepeta cataria). Catmint is a beautiful garden plant with aromatic grey leaves and spikes of mauve flowers that attract bees. Herbs for shade and shelter such as large bushy perennial herbs like rosemary (Rosmarinus officinalis) and lavender. 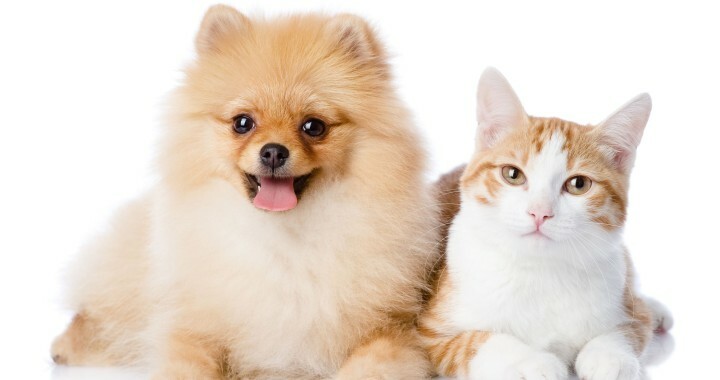 Both are excellent flea repellents and an infusion can be used to wash or spray the coat. Other herbs that repel fleas are pyrethrum, tansy, catnip, and penny royal. Herbal remedies should always be used with caution, and this applies as much to animals as it does with people. Always consult the vet first if there is a problem Make sure the herb is correctly identified by its botanical name and do your homework with regard to the correct dosages. As with people herbs are most effective when used as a preventative measure or to build health. General tonic herbs include parsley, comfrey leaves, pennywort, borage and yarrow. A weekly dose of one tonic herb should be part of their general health maintenance routine. Digestive herbs include fennel and mint, especially Peppermint (Menthapiperita), which can be used in small quantities to provide digestive support to both dogs and cats. It has a beneficial effect on the digestive system and also soothes the nervous system which is important when animals are feeling anxious. Arthritis and inflammation generally affects older pets and the herbs that can help that are feverfew, comfrey leaves, celery, parsley and yarrow. Add chopped up herbs in small quantities to the food. Worms and parasites can be minimised by usingyarrow, thyme and oregano. Add small amounts of the chopped fresh leaves to food once a week. Skin care herbs are calendula, thyme, chamomile, lavender and gotu kola. They can be used internally and externally to keep the coat and skin healthy and reduce irritation. Make a herb tea and put it into a plant mister and lightly spray onto the affected area. Unlike greasy ointments or salves, it is less likely to be licked off. Good to know: Louis van Aswegen from Healthy Living Herbs (also an animal lover) recommends using fresh herbs, finely chopped up and sprinkled in small amounts over the food or added to gravies for the dogs. Sprinkles provide a small amount of the herb in its entirety and this is likely to enhance the body’s balance yet does not contain enough active chemical substances to be toxic. If there is resistance to fresh herbs, make a mild herb tea using one teaspoon to one tablespoon of freshly chopped herbs to one cup of boiled water. Let the tea cool to room temperature and pour it over the food. Posted in Pets and tagged beneficial, garden, health, herbs, Pets, protect.